We invite you to click through our website and be inspired by the ways in which God’s Holy Spirit is moving through our dedicated and vibrant community; by the ways people find hope and friendship in our church family; and so, be inspired to join us in worship. Our worship services - like our building - reflect a mixing and blending of the traditional and more modern; music and singing are an important and integral part of our worship. Trinity is classically Anglican in its design. It is the oldest church in Durham, the building dating from 1860, yet it is wheelchair accessible as a result of a beautiful addition to the church built in 1990. As a congregation, we are actively seeking new directions to serve Jesus Christ by sharing and living our faith in our lives—as individuals, within our church family and in our community. Join us as we live our vision as an energized, vibrant church, dedicated to serving God. If you knit or crochet or want to learn how - join us every Tuesday afternoon 1-3pm for our charitable knitting sessions. We have patterns, yarn and needles or you can bring your own. All items will be donated to those who have a need in the area, be they homeless, in a nursing home, hospitals or just going through a rough patch and in need of a little comfort. 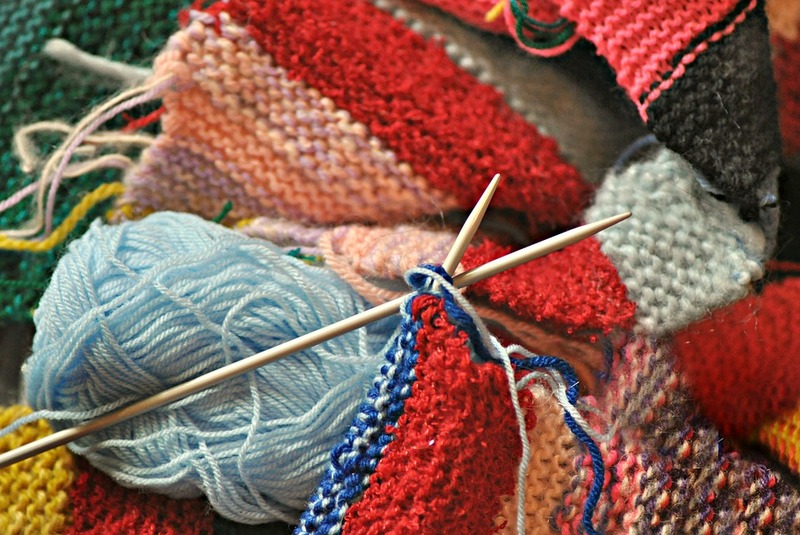 Donations of yarn and needles, crochet hooks are welcome! Come stitch with us! Everyone is welcome! ArthurRigland Mulholland. A name that might not be familiar with many in town, but those familiar with the history of the Anglican Church in Durham will know who he is. was given his choice of going to Australia or Canada. The decision was made and his life in Canada was about to begin. Divinity College at Coburg. He passed the exam and was ordained a deacon by Bishop Strachan on August19,1849 in Saint George’s Church in Kingston. This must have been a dizzying time for the Mulholland & his family. In just a few short months they had left their native Ireland, arrived in a new country, and were now given a new missionary parish to minister and to call home. Bishop Strachan sent the Mulholland family to Sydenham (which is now the City of Owen Sound), where Arthur was given license to administer the sacraments. The new missionary parish would cover all of what today encompasses Grey and Bruce Counties. By October 1849 the family had settled into their new life and home. It was now time for the Reverend to gofurthera field and explore his new parish territory. An interesting side note, Mulholland travelled his new parish on horseback – a white horse in fact – he was one of the few people in this entire area to own a horse. His vocation lead him to preach in various communities in Grey/Bruce,eventually he made his way to Durham. His arrival in the community was met with much delight by the settlers in town and the surrounding countryside. He landed in town afteranalldayjourneyby horseback, on a Saturday, in November of 1849. He arrived a day early to prepare for the service on Sunday and to also meet the local town’s people and discuss where the service would be held. There were no churches built in town at that time, so the services were held in private homes. This first Anglican Service was held at the homeofMr.John Hobson Edge. His home was located near the town mill and it was a good size to accommodate the large crowd that was expected to show. On Sunday the Edge home was filled to the rafters with citizens of Durham and area. Many travelled great distances to hear a Church of England service, something they had not witnessed since leaving the old country. Also, many families in attendance were hoping to have their children baptised during the service. with them on their journey to Canada. Of the families in attendance at that first service, the Rev. could remember names such as Edge, Blake, Hopkins, Cuff, Moody, and Jones to name but a few. These families, who originally came from every corner of the British Isles, now assembled together for a church service in their new homeland. Also in attendance were George Jackson, the Crown Land Agent, and later Member of Parliament for the electoral district of Grey South, and Archibald Hunter, founder of the town of Durham. There were no musical instruments of any nature at that first service but there were many singing voices in fine form and the beautiful old hymns were sung with much joy and heart. That must have been a special moment for all who attended – a moment not soon forgotten. Reverend Mulholland, on further remembrance, said that in all his years as a minister, he had never heard the Grand Old Hundredth Psalm sung as heartedly as he did at that first service. And so the very first Anglican Church service in Durham came to pass. It strengthened founding members of our town, it created bonds of friendship & camaraderie, and it established faith and strengthened resolve. Built to overlook the Saugeen River and on the site where the first pioneer settler camped, Trinity is classically Anglican in its design. It is the oldest church in Durham, the building dating from 1860, yet it is wheelchair accessible as a result of a beautiful addition to the church built in 1990. The ‘Trinity Window’, an unusual and unique feature of the church, was blown out in the “Great Storm of Good Friday 1913” and plastered over at the time. It was rediscovered in a more recent renovation of the church, fragments of glass and pattern matched and now is restored to its original beauty.